A Kiss For The Petals The New Generation Now On Sale! 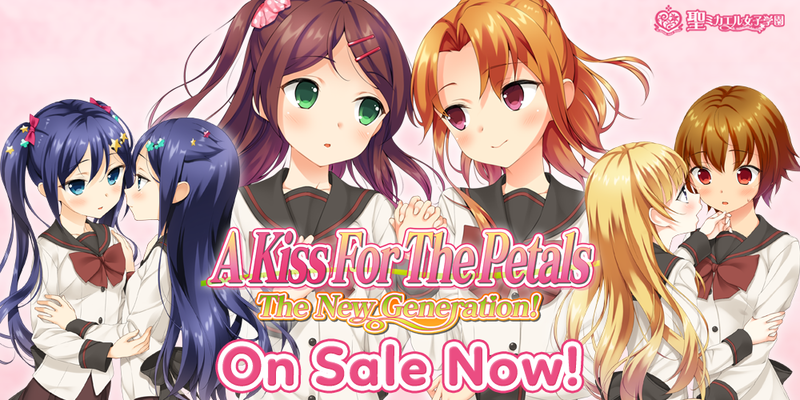 A Kiss For The Petals The New Generation is on sale! You can pick up the yuri goodness right now for Windows, Mac and Linux! Don’t forget to keep an eye on the official site for more updates to the White Lily Memorial short stories too. Tagged a kiss for the petals, st michaels, yuri. You wrote now for “Windows, Mac and Linux!” but in Downloads only “Download #1 is the PC release. Download #2 is the Mac release.”. Were is Download #2 for Linux? The version listed for PC is for Windows and Linux x86. Previously, Ren’Py provided a single distribution for all platforms, but changes in macOS necessitated a separate package for that platform. Thank you so much for the release. If this sees a physical release later down the line, I will absolutely buy it again. Loving it so far (2/3 routes complete) and hope you can continue releasing more in the series.